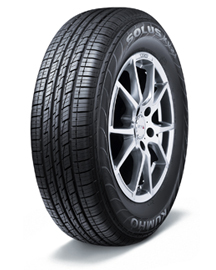 Kumho Tire developed the Eco Solus KL21 specifically for the premium crossover and sport utility vehicles in the marketplace. Used as original equipment by Hyundai and Kia, the Eco Solus KL21 has been engineered with a focus on luxury, all-season traction and ride comfort with improved rolling resistance and fuel economy. The Eco Solus KL21 size offering ranges from 16- to 20-inch wheel diameters and covers more than 35 SUV and CUV original equipment fitments in the marketplace. The Eco Solus KL21 is backed by a 60,000 mile limited tread wear warranty (mileage warranty not valid for original equipment).